The pick-up point for Penang Island is in front of 1-G, King Street, Penang and in front of Masjid Seberang Jaya for Seberang Perai. Members who wish to attend the Seminar will have to pay RM170.00 (inclusive of transportation, hotel accommodation on a twin-sharing basis and two meals i.e. lunch and breakfast) Registration will commence on 4 June 2018 and close on 11 June 2018 or upon reaching 160 participants whichever is earlier. The sum of RM170.00 is nonrefundable. 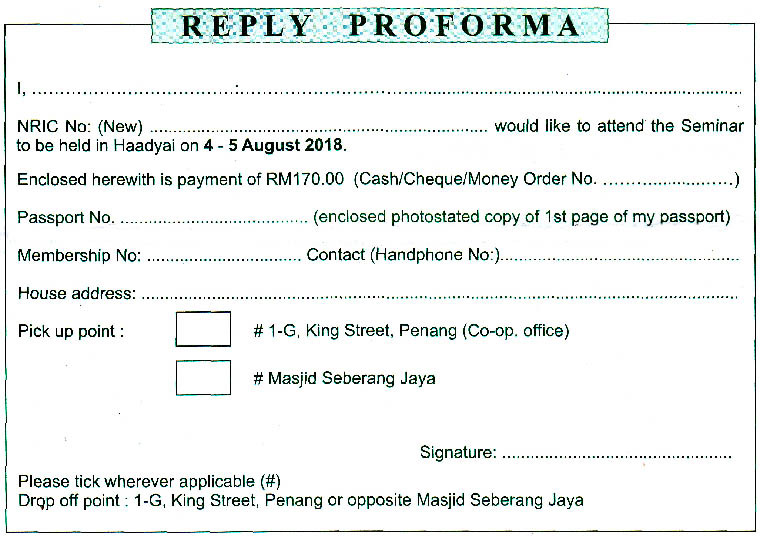 Payment shall be made by cash/cheque or money order in favour of Koperasi Guru Pulau Pinang Berhad. Members who have booked and subsequently unable to attend my transfer the booking to another member. Any change in name must be submitted to the office not later than two weeks before the Seminar. Kindly ensure that your passport is valid for at least six months after the departure date. Kindly provide the office with a photostated copy of the first page of your passport when registering. You are reminded to apply for permission to leave the country now.